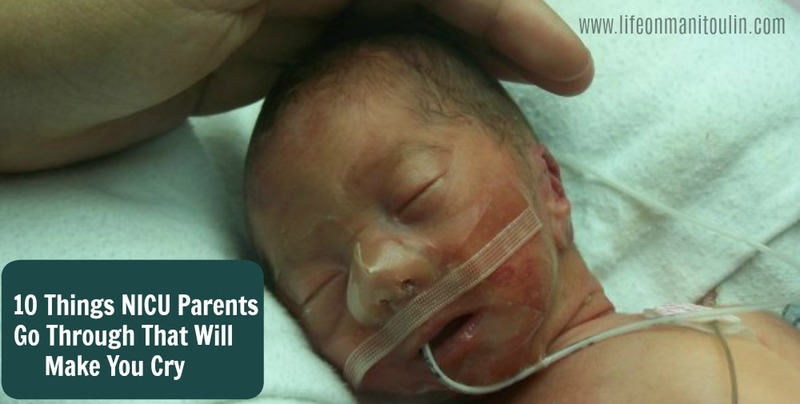 I can tell you from experience that there are many things NICU parents go through that will make you cry. September is NICU Awareness Month and in an effort to support other NICU families, I hoped to share my story with you and offer a NICU Care Package that I’ve personally curated with Huggies to help make a family’s time in the NICU a little bit easier. The date on this photo is actually incorrect. Little One was born on November 11, 2008. As a mom of a preemie, I am thankful for community. Without my online community, my NICU community at Mount Sinai Hospital in Toronto, and my community of friends and family on Manitoulin Island, our NICU experience would have been far more of a challenge than it was. In hindsight, those early days were filled with so much worry, that I do not know if I would have survived without my “community”. The birth/delivery you expected and planned for was not the experience you ended up with. I had dreamed of a home water birth with a midwife and doula. My pregnancy and Little One’s birth did not go as I anticipated. What was supposed to be the happiest and most exciting time of my life turned out to be the scariest time of my life. You don’t get to hold your baby right away or take your baby home with you. Every mom envisions the moment their baby is born and dreams of holding that baby as soon as he or she enters the world. Instead, for many parents with NICU babies, their infants are rushed away to be taken care of and mom has to be tended to as well. It’s not like in the movies where the mom pushes, out comes a beautiful crying baby to be put on moms chest right away. No tender kisses and cuddles. It’s time to take care of that new baby and in out case, Little One had an NG tube, C-Pap, had attachments and leads put on her, and was in an isolette. Every day is a roller coaster of emotions. For many NICU parents, each day in the NICU is a roller coaster of emotions. One never knows if baby is going to be having a good or bad day. One day, baby will be progressing well, and the next something may happen like baby needing a spinal tap or a blood transfusion because baby somehow ended up with an infection. You don’t get to introduce baby to the family right away. With a baby in the NICU, there’s no big homecoming right away or “meet the baby”. In fact, parents want to keep visitors at bay so as not to expose baby to possible infections. No touching, baby holding, kissing, or cuddling from relatives and loved ones until baby is strong enough and at home. Separation anxiety is hard. It’s really tough having to leave the hospital and go home every evening…without your baby. When Little One was in the NICU at Mount Sinai, I was commuting from my aunt’s home in North York every day. Hubby was still on Manitoulin Island, and commuted 6 hrs to and from Toronto every other weekend to be with us. Not being with Little One all the time was hard — especially at night when I’d lay awake wondering if she was okay. I’d call the NICU in the middle of the night to check on Little One. Sleep deprivation of a different kind. Of course, sleep deprivation is not uncommon and every parent knows what it’s like to function on next to no sleep. Having a baby in the NICU, pumping every few hours, and commuting to and from the hospital every day of the week totally did me in. I was running on auto-pilot. Skin-to-skin is the most amazing feeling for a parent of a preemie. Because I didn’t get to hold my baby when she was newly born, and had to wait almost almost two weeks until I could do skin-to-skin, that first time I held her to my chest was an emotional time. Little One’s primary nurse told me about the benefits of skin-to-skin are incredible. Both mother and baby relax, and baby’s breathing, body temperature, and heart rate stabilize. 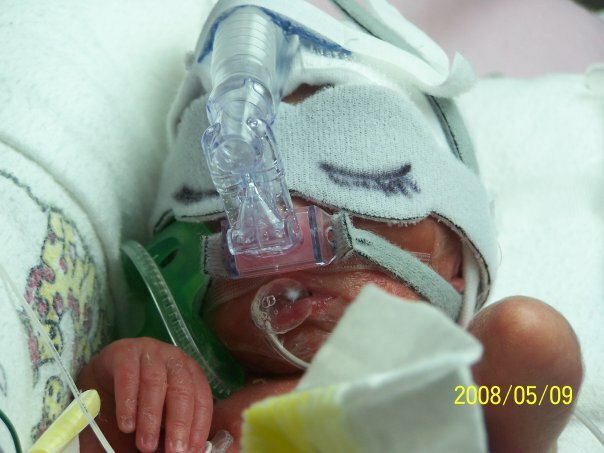 NICU parents and PTSD — it’s a real thing. Having an infant hospitalized in the neonatal intensive care unit is an unexpected and traumatic event. For me, I didn’t realize I was suffering a bit from PTSD until months after we brought Little One home from the hospital. The weeks of bed rest and her “spontaneous birth”, the months of care in the NICU, and a combination of everything else just seemed so overwhelming once I had time to process everything we had gone through. Not being in your own home together as a family is a bit depressing. Some days, you just want to lay on the sofa with your family and watch TV, or hold your baby in the comfort of your own home, or eat a home cooked meal together as a family. However, your days and parts of your evening are spent in the hospital, being there for your infant, pumping, or being present for rounds so you can speak with the medical team about your baby’s progress. Being home and together as a family after months in the hospital is the sweetest gift. Being able to hold my baby and be with my baby as much as possible was the biggest blessing I received. I vowed to hold that baby and do skin-to-skin as much as I could. I remember the day Little One’s primary nurse told me that I could finally hold my baby girl. It was one of the greatest days of my life. She was so tiny and so fragile. That day, I learned just how important skin-to-skin was and the nurse encouraged us to practice skin-to-skin as much as possible at home — especially in the first few months. This is why I am a big advocate for skin-to-skin care in hospital and at home. I love that Huggies also deeply believes in skin-to-skin and they offer a ton of great tips and information on skin-to-skin on their website. The great news is that new dads can provide skin-to-skin hugs to their babies too! The more hugs, the better! Before or after diaper changes: The average child has over 5,000 diaper changes in their lifetime — That’s 5,000 opportunities for hugs! During this time, baby is already unclothed, and this is a special time for parent and baby, making it the perfect opportunity to maximize hug time. Huggies® has always supported NICUs and in 2015, the brand launched No Baby Unhugged*, an initiative to help ensure all babies get the hugs they need, even when moms can’t be there. As part of this initiative, Huggies® provides funding to facilitate volunteer hugging programs in Canadian hospitals, in partnership with the Canadian Association of Pediatric Health Centres (CAPHC), that helps babies get the hugs they need, especially when mom can’t be there. To-date, Huggies® has partnered with Cape Breton Regional Hospital (Sydney, Nova Scotia), Southlake Regional Health Centre (Newmarket, Ontario) and Victoria General Hospital (Victoria, British Columbia), with a commitment to continuing to fund hugging programs in additional hospitals across Canada. Visit nobabyunhugged.ca to show your support for hugs by becoming a No Baby Unhugged* mom. When you do, you’ll receive a free pack of Huggies® diapers for your newborn (while supplies last) and in return, Huggies® will donate $5 to to the No Baby Unhugged initiative! 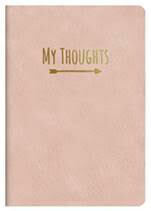 A journal to keep my thoughts in. I wrote down everything. I kept notes on Little One’s progress and wrote down questions and concerns. That way, when the doctors were on rounds, I wouldn’t forget anything. I also wrote down how I was feeling and what I was going through. The nurses kept reminding me of how important it is to keep hydrated. A water bottle filled several times a day is so important. I highly recommend all moms in the NICU to keep a water bottle with them at all times. A Tim Horton’s gift card is a good idea! You’ll be spending many hours in the hospital! The cards come in handy for coffee, lunch, or a snack. Because we know what it’s like having an infant in the NICU, and because September is NICU Awareness Month, Huggies and I are giving away this amazing NICU care package! 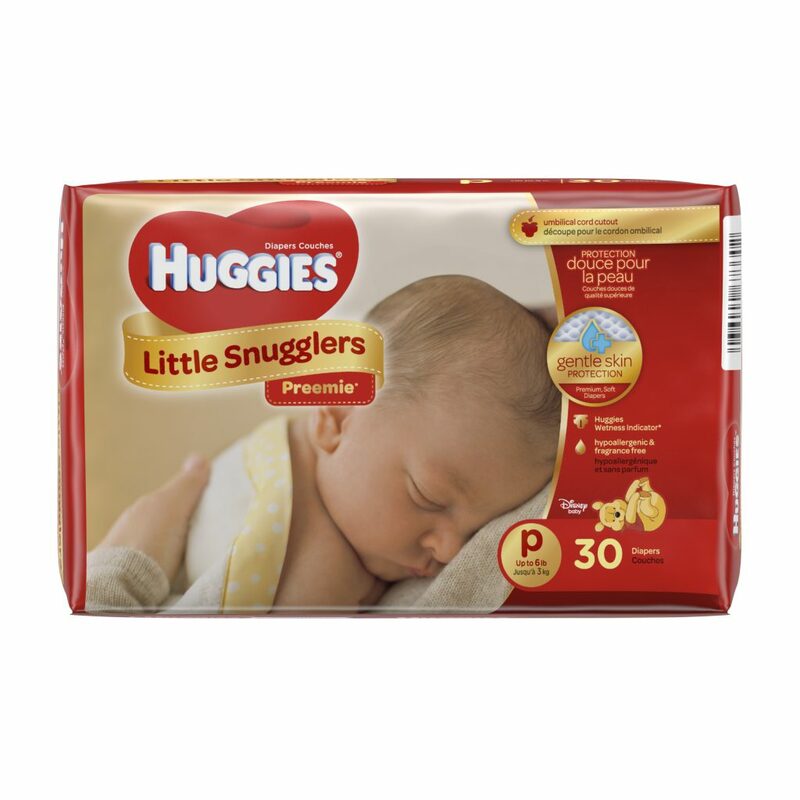 Huggies Little Snugglers Diapers in Newborn and Size 1 – mom will have plenty of diapers on hand when the little one comes home and grows out of their newborn diapers. Huggies Natural Care Wipes – with Vitamin E and Aloe, these wipes are soft and soothing for baby’s delicate skin. Organic cotton swaddle blanket – a multi-functional blanket is perfect to help enable more skin-to-skin hugs at home! Skin-to-skin offers an incredible amount of benefits for babies including temperature regulation, lower response to pain, and bonding. Read more about the power of skin-to-skin hugs here. Journal – for keeping all your thoughts and experiences in. Also great for jotting down questions to ask the nurses and doctors if you have any concerns regarding your baby. Water bottle – keeping hydrated is important every day, but when you are spending long hours in the NICU, it’s especially important. Also, if you’re nursing or pumping, you want to keep hydrated even more so! Tim Horoton’s Gift Card – Long days in the NICU call for coffee breaks, snack time, or even lunch or dinner breaks! 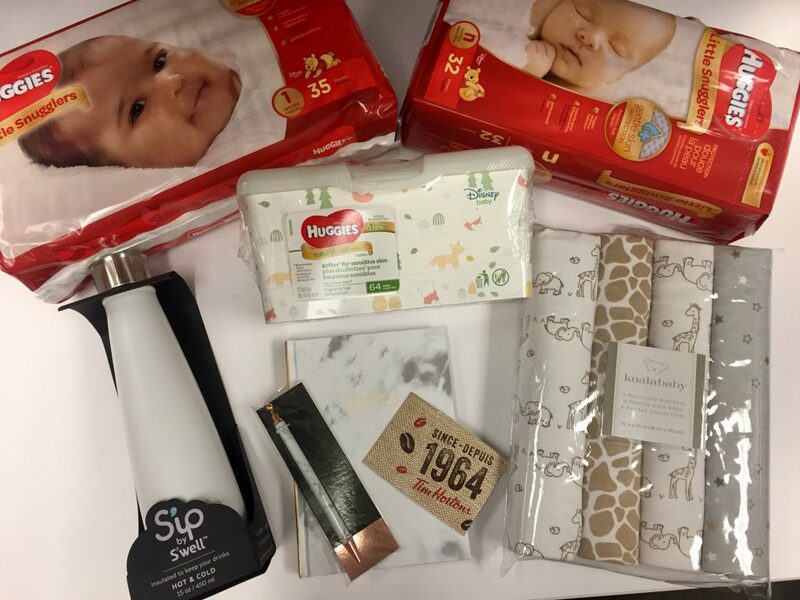 Life on Manitoulin and Huggies are giving away 1 awesome care package to a NICU family! If you are a parent of a baby who is in the NICU or if you know a NICU family, please enter this giveaway! Giveaway open to residents of Canada, excluding Quebec. Ends September 29, 2017. To enter, simply follow the instructions in the Rafflecopter form. Disclosure – This post was written in partnership with Huggies. All thoughts and opinions expressed on this blog are my own. I know how difficult it can be if the baby goes into NICUbecause our little grandson was there. It is so vitally important to have family and friends around until things improve.It is so nerve racking.It was love and support that got us through this trying time. I love this. Can i copy your 10 points and share my story just as you did on my blog in honor of NICU awareness month. Don’t worry, we’ve got your comment, even if you can’t see it right now. My daughter spent 3 weeks in NICU due to being a preemie and having breathing problems. It was hell. I did a lot of crossword puzzles to keep my sanity. My experience with nicu was short compared to most but it was the most stressful few days of my life. I’m really glad I had my iPod with me; I find music calms me. Gift cards for food were a blessing cause I could not even think about cooking anything during that time. my son was not in the nicu but in the infant critical care ward at birth and i can tell you my emotions were up and down like a roller coaster. one thing that helped me was emotional support from family an amazing husband and amazing nurses that not only cared for my son but me as well i remember not leaving that room for like 2 days i was afraid that he would pass the nurse came in and to my surprise had bought me a huge pizza pop and cofee lets say i was in tears thankfully i took little man home 8 days later and is fine. My granddaughter was born a bit early and was in the Nicu for a few days and you need lots of support and this prize pack would be so helpful. Carole, hope your granddaughter is doing well. So true that families need lots of support when they have a little one in the NICU. Definitely support for them is a big thing, offering to give them help out at home so they can spend more time at the hospital is always a great ides. I don’t know a family dealing with the NICU right now but if I won, I would love to take it to our local NICU unit and donate it to a family there. I guess my NICU story is that I was a preemie (3 months early) and have heard stories of what my parents went through, so I have always had a passion for this cause and giving back. I have knit hats before to donate to the NICU. Judy, that is so awesome that you have knit hats to donate to the NICU, Wow. I had no idea you were a preemie. My little one was 3 months early as well! Diapers, wipes, a blanket, and something fun to do like a journal or a book are essentials! I work with a lady that just had her baby and is in the NICU,. We have had a few chats about the costs of having the baby there, you really don’t realize how expensive it becomes even by the smallest things like coffee, snacks ect. this is an incredible contest to help out families that could use it, Thank you for the chance! My friends lil boy was in NICU last year , now he is doing great and just turned 1! It was ruff on her and the dad , we brought them up dinner a few times , and a few times after they got home to try to make it a bit easier on them, Its hard to be prepared for that ! The best thing you can have is support from family and friends, and lots of coffee and hugs! Never been to the NICU but I know lots of parents who have. One friend who spent a few weeks there said having her mom there with her and when she couldnt be there made her experience there better then it would have been. The best thing to have and except is all the support you can get. I have a niece who was in the NICU, I saw that the best thing they had was support from friends and family outside of the hospital. People to take care of the house, do laundry and dishes, make food. All without being asked. I never had a NICU experience but I have friends who did and a friend who is currently spending time there. Some of her must haves include snacks, reading material and a good water bottle! I have a very close friend who spent 54 days in the hospital when her little one was born. She says her journal became her best friend (besides the awesome nurses of course!) during those long days. If I win I will be passing this prize along to the local pregnant and parenting youth support group.